Louise Vigee Le Brun hated Caroline Bonaparte. Caroline was a sister of Napoleon, and Louise was still loyal to her dead patroness Marie Antoinette and disliked the new regime. Nonetheless, she accepted Napoleon’s commission to paint his sister, though she was paid less than half of her usual rate, and even threw in Caroline’s daughter for free. Louise wrote in her memoirs, “I could not conceivably describe all the annoyances, all the torments I underwent in painting this picture.” Caroline showed up for her first sitting with maids to do her hair while she was being painted. Louise got her to send the maids away, appealing to her vanity by saying that she couldn’t do her justice with such distractions. Caroline was also habitually late, or skipped appointments without telling Louise beforehand. To make matters worse, Caroline capriciously changed her hairstyle and fashions to keep up with the latest trends, so that Louise had to scrape off and repaint the portrait several times. She was thus obliged to stay in Paris the whole summer, though she had planned to travel. Louise finally got so fed up that she said loudly enough for Caroline to hear, “I have painted real princesses who never tormented me or kept me waiting.” Oh, burn! Needless to say, Louise received no further commissions from Napoleon’s family. She was probably right about Caroline, who was a #nastywoman, and not in the good way. Caroline incurred Napoleon’s wrath when she fell in love with one of his generals, but Napoleon’s wife Josephine interceded on her behalf so that they could marry. Caroline repaid Josephine’s support by arranging for Napoleon to knock up another woman, proving that Josephine, not Napoleon, was infertile. 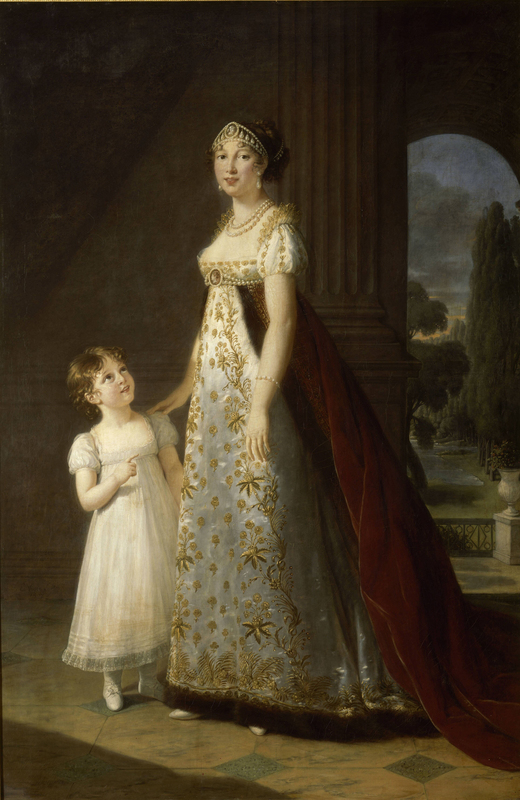 When Napoleon subsequently dumped Josephine for the younger Marie-Louise of Austria, Caroline was in charge of escorting her brother’s new wife to France. She forced Marie-Louise to give up all her entourage and personal belongings, including her pet dog. This was sometimes common practice for royal brides, but still not a very nice thing to do. Caroline’s great-great-great-grandson is Star Trek actor Rene Auberjonois. That doesn’t make her any nicer, but it’s kind of cool trivia! Louise Elisabeth Vigee Le Brun, Memoirs of Madame Vigee Lebrun (New York: George Braziller, Inc., 1989), 202-03. Gita May, Elisabeth Vigee Le Brun: The Odyssey of an Artist in an Age of Revolution (New Haven and London: Yale University Press, 2005), 178. Frances Mossiker, Napoleon and Josephine, (Avon, 1966), 282-84.